Carl Orff (1895-1982) made a sharp distinction between the works he composed before and after his celebrated "Carmina Burana." There is something to be said for that, though based on today's recording he went too far when he condemned the early works in a blanket fashion. Gesei (CPO 777 819-2), his first opera, enjoys a well put-together performance in the hands of Jacques Lacombe, soloists and the Chor und Orchester der Deutschen Oper Berlin. It is based on the Japanese 16th century Bunraku Kabuki play "Mirror of the Art of Caligraphy Transmitted by Chancellor Sugawara," more specifically the principal act "Terakoya" ("The Village School"), written by Takeda Izumo and three colleagues. "Gesei" ("The Sacrifice") is based on Karl Florenz's translation. The plot line is involved and for this review I will leave that for those who ultimately wish to experience the music. Orff's disdain for his earlier works have not encouraged their revival over the years. 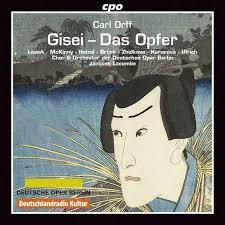 Yet "Gesei" has a great deal to offer in the quality of its music, its nicely wrought orchestration, its dramatic arc. Admittedly this is Orff in a more eclectic period. One is most certainly reminded of Debussy's Pelléas et Mélisande for its orchestral mystery, and traces of Wagner perhaps. Soprano Kathryn Lewek in the principal role of Kwan Sushai is convincing as is the cast in general. The orchestra and chorus give us a near impeccable reading thanks to Jacques Lacombe's interpretive acumen. The music is memorable if not in any way as original as Orff's later works. It is a revelation for those who appreciate his music, myself included, and stands on its own as a worthy experience. It does not show immaturity but rather a good deal of brilliant craftsmanship. I would recommend it, especially if you are disposed toward the composer. The spirit of adventure has in no way disappeared from the new music scene. 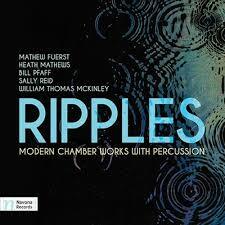 A great example is in the anthology Ripples, Modern Chamber Works with Percussion (Navona 6033). There are five composers and works represented, each with a prominent, often virtuoso part for a percussionist. "Broken Cycle" by Mathew Fuerst is performed by ReadyGo--Stacey Jones-Garrison (percussion) and Brad Blackham (piano). Marimba and piano begin the work with rapid post-minimalist motored patterns and then quickly segue into a fantastic set of asymmetrical figures for piano and temple block-toms, then move forward once more into vibes-piano figurations and so on. A bracing beginning! 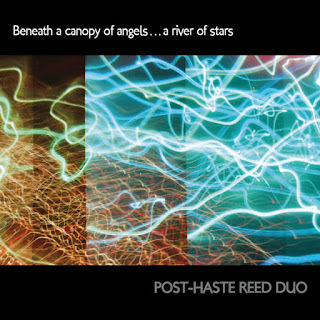 Heath Mathews gives us "Digressions" for Duo Zeno--Preston Duncan on sax and Scotty Horey on percussion. This work features lively interplay between marimba and saxophones in a kind of variations-on-variations mode. Bill Pfaff's "Lichen" is more contemplative, giving a dialog to marimba and piano that is reflective, then more dramatically assertive, but always nicely turned. Sally Reid's "Three Trifles" pits alto sax and tom toms, timpani, etc. in three short movements that begin with an exotic, world flavor, then contrast with passages quietly contemplative, and finally ending with the moving and brisk, with a complicated melodic role for drums/percussion. Matt Sharrock is musical and deftly accomplished as the percussionist for these two works. William Thomas McKinley's "A Different Drummer" was commissioned by Robert Black and the New York New Music Ensemble as a virtuoso vehicle for percussionist Daniel Druckman. At 25 minutes this is the longest and also the more involved work of all with a long-form chamber ensemble confluence that brings to the forefront Druckman's snare drumming, marimba, vibes, xylophone, melodically malleted toms, etc., in an ever-shifting confluence of sound color and instrumental juxtapositions. This is music with a classical-modern-and-beyond feel, quite nicely done. All of this involves music of contrasts, like an American Indian sweathouse, where one stays in an overheated building for a time, then plunges into an icy cold stream just outside. 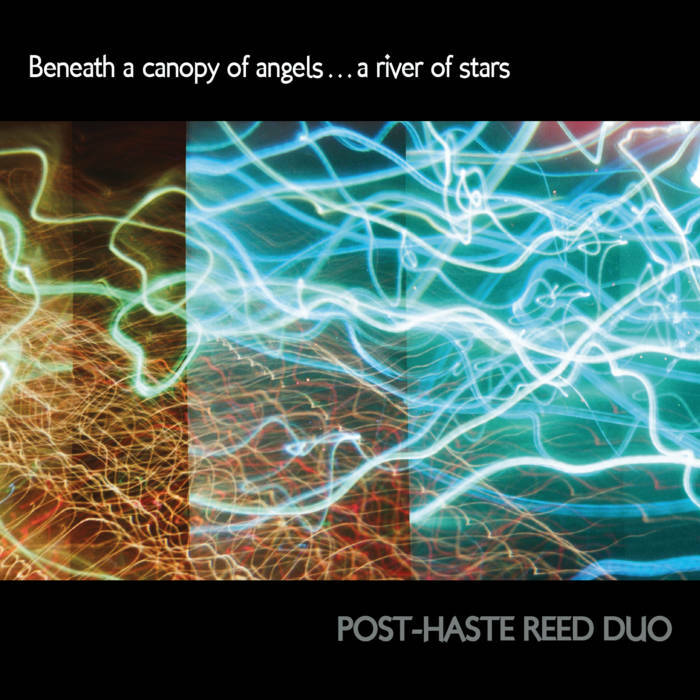 It is an album of musical substance, a sense of adventure and compositional singularity. Anyone who loves percussion played well will be attracted, as well as the general modern post-modern chamber aficionado. 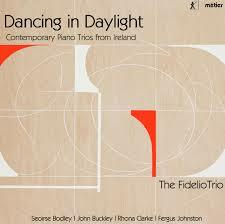 Ireland's most exciting news lately is the existence of the Fidelio Trio, a piano trio of great finesse and ability. They just completed a three-year residency at St. Patrick's College, Drumcondra, which is a college of Dublin City University. While there they performed four modern trios which they commissioned. We get to hear them play the works on the recent album Dancing in Daylight (Metier 28556). Adi Tal, cello, Darragh Morgan, violin, and Mary Dullea, piano, show us an expressive unity and depth that matches perfectly the considerable and sometimes wonderfully subtle musical demands made by the composers involved. John Buckley's "Piano Trio" (2013), Fergus Johnston's "Piano Trio" (2011), Rhona Clarke's "Piano Trio No. 2" (2001, rev. 2015) and Seoirse Bodley's "Piano Trio 'Dancing in Daylight'" (2014) are works as memorable as they are thoroughly of our times, modern-postmodern, tonal, dramatic and evocative, alive with rhythmic vitality such that one could well imagine dancing to parts of them. The Fidelio Trio have a remarkably pliable ensemble discipline that seems made to order for these works. Each of the three artists have beautiful tone, touch and articulatory clarity, and for each work they function with great subtlety in phrasing and making wholly present the many varied twists and turns with exceptionally musical style and grace. Each of the four works has a gem-like brilliance that shines forth, neither ignoring the piano trio legacy of past landmarks nor paying undue attention to them, but rather plotting a distinctly personal path that is not unlyrical most times but also briskly contemporary. There is an Irish quality to all of this, as certainly one might hope, something in the capturing the past and bringing it into the very open present-day of possibilities, something in its beautifully singing qualities. This no more so than in the title work by Bodley, but it is true in general of the four works. I am keen too on the atmospheric sort of haunted quality of Buckely's Trio, which to me expresses a mood not quite of melancholy but mysteriously contemplative. But then Johnston and Clarke give us music of a high order as well. The Irish part of me rejoices in the music, the other mutt-like aspects are impressed and no less enamored. It is a wonderful recital by a trio that breathes together as one, playing music that has both charm and musical significance. 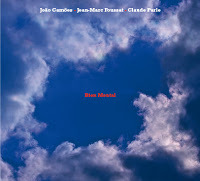 It is an exemplary disk for those wishing to explore the ultra-contemporary chamber music scene, where modernism has gone and what it can embrace, which is considerable in the hands of this talented trio and their composer brethren-sisteren. We contemplate today yet another modern composer you likely have never heard of, one Francis Chagrin (1905-72), born in Romania yet spending the bulk of his life in England, prolific composer of film music and nearly completely forgotten for his serious, ambitious works. 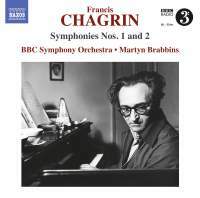 To give us an excellent look at the unknown symphonic composer, we have thankfully the BBC Symphony Orchestra under Martyn Brabbins and their presentation of Chagrin's Symphonies Nos. 1 and 2 (Naxos 8.571371). He was born of well-to-do Jewish parents in Bucharest, as Alexander Paucher. He showed a pronounced aptitude for music, secretly put himself through a conservatory program in Zurich while ostensibly studying for an engineering degree there since his parents expected him to join the family business. He managed to contract a failed marriage and become disowned by his family for his insistence on a musical career, and fled to Paris in 1928. There he changed his name, studied with Paul Dukas and Nadia Boulanger at the Ecole Normale and began writing music for film. With the looming war ahead and its insecurities (especially for a Jew) he then migrated to England, where he made his home from 1936 onward. He was able to thrive there through a successful and abundant production of film scores, creating over 200 of them over the rest of his life. But it is with his concert music that his talent comes through most readily. The two symphonies show us an original musical voice, dramatically expressive and very modern, a more dissonant and extroverted figure than, say, Hindemith, but sharing with him a kind of neo-classical penchant for unfolding, logical linearity. The "Symphony No. 1" was worked over a long time, from 1946-59 and again revised in 1965. It is a rather astoundingly original and expressive work, but then so is the later (1965-71) "Symphony No. 2." The world premiere recorded performances show us nicely the dramatic arcs of his music, well orchestrated and very dynamic. Martyn Brabbins and the BBC Philharmonic give us enthusiastic readings that bring out the salient qualities of the symphonies. This Francis Chagrin, had he been able to devote his full attention to concert works, might have become one of the brighter lights of the modernist century. These works show a fully formed original master, writing moving and even exciting music. I recommend the music to you highly, all you with an appreciation of the modern classical era, and all who are not afraid to open up to the lesser-known figures in the history of our times. Chagrin is brilliant, I would say! Or at least he shows that in the two symphonies. I must admit to start this review that I appear before you today with extreme prejudice. Prokofiev's "Piano Concerto No. 2" is my favorite Prokofiev work, and I would single it out as a favorite of mine from all the 20th century modern concertos I know. Now I may be the only one that puts this music on such a high pedestal, and if that is so it is of no importance to me. A beautifully lyrical, turbulent, bitterly dark work, it speaks to me after 100 years as strongly as it did when I was dutifully getting my hands on all the Prokofiev I could back around 1971. I found an LP with Karel Ancerl and the Czech Philharmonic doing it with pianist Dagmar Baloghova in 1963 on a US budget label that re-released Supraphons. It immediately captured me and I've been listening ever since. I've never quite found a version that compared with it for its brooding qualities and the full flush of its extraordinary outbursts, that is until now. 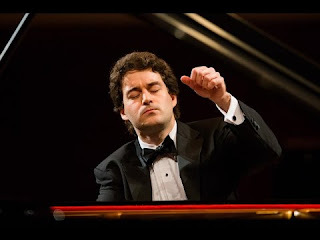 2013 Cliburn Gold Medalist Vadym Kholodenko is the pianist, the Ft. Worth Symphony the orchestra under Miguel Harth-Bedoya. This a SACD compatible disk that brings us the Prokofiev Second as well as the Fifth (Harmonia Mundi HMU 807631). The "Piano Concerto No. 5" is not as well known but has its own charm. Kholodenko and company do an excellent job with it and so it is here a worthy coupling with the Second. But I am especially thrilled with their performance with that Second. It has beautiful sound. It rivals and even exceeds my old Artia LP for its idiosyncratic, gloriously melodic darkness. Now maybe I am one of those who is glad to be unhappy, but I think not. Because Prokofiev transcends the turmoil and the darkness with some of the most beautiful music I know. You come away from the work feeling that Serge has dispelled the storm clouds, that with music such as this we can carry on and be wonderfully human, somehow. Kholodenko understands all that, I think, and manages to convey through the formidably compelling solo part that the orchestral girth and power can be coalesced and contained by the single solo voice. I wax on here but if you hear this recording a few times I think you might understand. Prokofiev especially in the early period was a master of the motor impulse rhythms that for him connoted perhaps upheaval, progress, change, industry, a modern world he occupied with a certain insecurity natural to the times. The Second captures that wonderfully. But it also has in wonderful form his melodic genius, something Prokofiev put forward beautifully throughout his career, but never more memorably than with this concerto. The melodic arc of solo part and the impassioned thrumming of the orchestral backdrop is unforgettable, to me at least. The version contained in the new disk I would recommend as essential, and for the 5th too this disk is fabulous. Get this one! 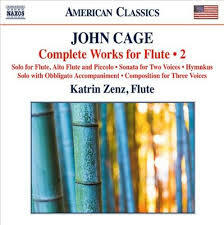 Flautist Katrin Zenz continues her excellent explorations of John Cage in the Complete Works for Flute 2 (Naxos 8.559774). In this volume she gives us lesser-known works from the early, middle and later periods, many in first recordings. For my review article on the first volume, type "Cage" into the index box above. The "Solo for Flute, Alto Flute and Piccolo" (1957-8) comes out of pages 133-144 of the "Concert for Piano and Orchestra," which does not have a score, but pages that can be played together or by separate instrument(s), in effect making possible many works. This realization gives us multiple flute soundings of melodic material typical of the middle period, performed nicely. Then follows a series of earlier works never before recorded: "Solo with Obbligato Accompaniment of Two Voices in Canon, and Six Short Inventions on the Subject of the Solo" (1933-34) in a version for alto flute, piano and vibraphone arranged by Anargyros Deniosos. It has an expanded tonality, early serialist feel to it but an early Cagean earthiness, as do the following "Composition for Three Voices" (1934) in a Zenz arranged version for flute, alto flute and bass flute made possible by multi-tracking; and the "Sonata for Two Voices" (1933) arranged once again by Zenz for flute and bass flute. These are nicely modern works that happily are in first recordings in the present form. Finally we have a 30-minute major later period work "Hymnkus" (1986), in a Deniosos-arranged version for flute, two pianos and two vibraphones. The work makes hypnotic use of a limited number of notes at any given time (all possibilities chromatically from c to d1) in seemingly an infinitely variable sequence of rhythmic entrances, with at first the sequences disjointed and sporadic, then more insistent. The music is divided into 17-tone event clusters that vary in speed and require each musician to move from one event to the next at a different rate according to the part involved, so that the overlapping universes of soundings becomes very involved and fascinating to hear. This is a more minimalist sort of Cage than we are used to experiencing. It is a first recording as well and a very illuminating one at that. So in the end we get a good deal of unheard sonances from the early and later works and a unique, previously unheard realization of part of a well-known classic middle phase work. Katrin's flute is wonderfully played and she triumphs over some music that in lesser hands might become tedious. Compliments must also be given to her fellow ensemble mates--Tobias Liebezeit and Maxim Mankovski on vibraphones, and Chara Iacovidou and Ludovic Frochot on pianos. In all this is a most provocative but also very pleasurable volume of early and later high modernist Cage. Those who would like to know more about the method Cage uses to assemble each work are referred to the detailed liner notes. Ultimately the music SOUNDS well, very well, which in the end should be our main criterion for listening. That this is so is of course a testament to Cage's brilliance but also to the superlative artistry of Ms. Zenz, her thorough research that has unearthed worthy treasures, and to the artistry of her chamber-mates. For the flute afficionado and new music/Cage enthusiast this one is invaluable and invigorating. It may easily appeal to the non-specializing listener who seeks something adventurous, too. Molto bravo! When it is a matter of Harry Christophers conducting the Handel and Haydn Society, of an unbroken tradition of Haydn performances in the US for more than 200 years, you know you are in for some authentic and engaging music. And indeed that is what you get on their latest, Symphony No. 7 Le midi, Symphony No. 83 La poule, and the Violin Concerto in C major (CORO 139). 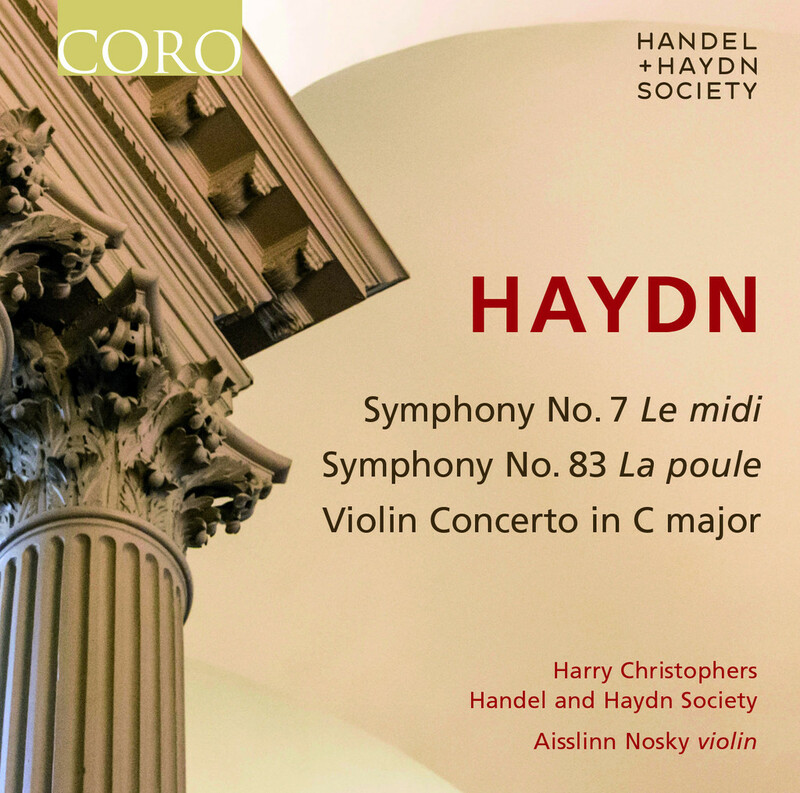 This is volume 2 in their latest coverage of Haydn Symphonic gems. I waxed enthusiastic for the first some time ago here when it came out (type Haydn in the search box above) and I am happy to say that this volume continues the excellence. There is a right-sized orchestra for authentic practice, no 120 musicians creating imposing Beethoven-Bruckner mountains of accretion. Not surprising. Gottlieb Graupner, a founder of the orchestra, was oboist performing Haydn in London before he moved to Boston. And in Harry Christophers, director of the H & H since 2008 and also of the acclaimed early music group the Sixteen, we have a master of the authentic nuances of these works. The live recording in Boston's Symphony Hall has real presence. The "Violin Concerto in C major" is an especially nice addition, as it is not as well known as it should be. It was only published in the 20th century. Concertmaster Aisslinn Nosky does a fine job with the solo part, unfussy and direct. And we get two excellent examples of early and later Haydn symphonies, the Seventh with its grace and uncomplicated freshness, the 83rd with its more developed dramatic complications, each in its own way superb and superbly played. I give you my strongest recommendations for this offering. It leaves nothing to be desired. 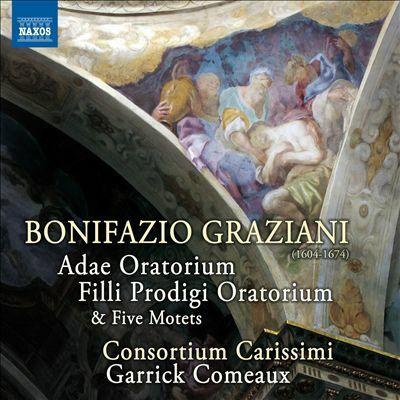 We return to the music of Bonifazio Graziani (1604-1664) with another engaging volume by Consortium Carissimi under Garrick Comeaux. Cantatas, Op. 25 (Naxos 8.573257) gives us a goodly assortment of 12 such, all in world premiere recordings. It affirms his stature as a composer of great skill and expressive elan, a jewel in the crown of the mid-seventeenth Italian baroque. I covered his earlier volume several weeks ago (see the index). His position as maestro di cappella in Rome's Jesuit Church during a creative period in sacred music helped him as the need for new liturgical music was acute. Thanks to place, time and talent he was a key member of the "School of Roman Polyphony." This set of cantatas (which functioned in the liturgy as motets) was published in 1678 and gives us a wealth of examples, all in concertate manner with the inclusion of, in various configurations, archlute, theorbo, viola da gamba, sackbut, harpsichord and/or organ. The vocal parts vary from solo motets for a single voice, to those for two voices, three voices, sometimes in the form of dialogues, and one for three sopranos and tenor. The consortium gives us, due to space considerations, 12 of the total of 14 works here. They are very worthwhile. Subject matter varies between Lenten and Christmas themed works and those that fall somewhere in between. All have a beautiful ambiance heightened by the stringed accompaniments; the consortium gives us the period sweetness that marks the music as singular along with the line-crafting brilliance of the composer. In the end one is moved, ravished and delighted by these miniature masterworks. It affirms, perhaps even more definitively than the earlier volume, that Graziani was a fine composer, fully worthy of our appreciation as a master of the concertate style, a creator who holds his own as a singular voice of the period. The Consortium Carissimi gives us readings of world-class depth and attention to detail. Anyone interested in early music will not fail to appreciate this disk, and fledglings to the spectrum of early baroque will I do not doubt be intrigued as well. Highly recommended. 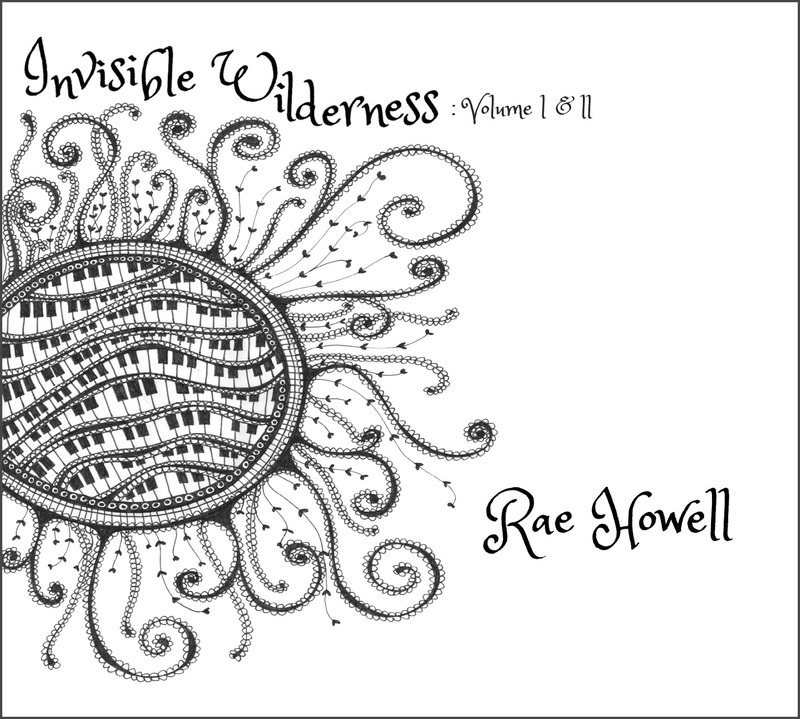 Rae Howell writes music with a kind of homespun lyricism and often enough a pronounced harmonic movement, in a minimalist postmodern vein. 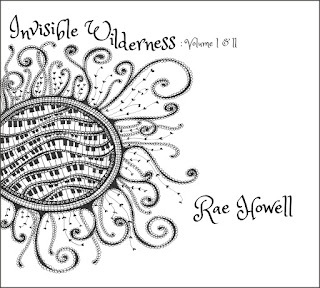 At least that is the case on her two-volume recording of works for solo piano and electric piano, Invisible Wilderness, Volume 1 & 2 (Sunwrae SWR 05). She hails from Australia, currently resides in England, and something of her experience of the rural landscape in her homeland and beyond suffuses the music, to my ears. Volume 1 is her music from grand piano, slightly more formal than Volume 2, which uses old uprights to get characteristic sounds one can get from ramshackle instruments, plus some pieces for electric piano. There are improvisations as well as compositions, all with a kind of open approach that may sometimes bring in jazz or song elements, always as part of a woven web of sounds that is original and personal. These were written over a 15-year period and constitute a kind of aural biography of her life and its intimate interaction with the piano. Some of it sounds slightly Glassian, with perhaps a dash of Satie's ambiance. Generally speaking a goodly inventiveness of thematics carries the day, along with a vibrant rhythmic vitality. The music bears up under repeated hearings and brings you a kind of lyrical warmth. Bravo! There is a 84-page volume of sheet music that is available, containing 12 of these works. Check her website raehowellmusic.com for more information on all this and to order. Chances are good that if somebody asked you to, quick, name a great composer, you would not immediately answer "Leo Weiner" (1885-1960). Part of that reflects the obscurity of his career to those of us at least outside Hungary. During his lifetime there he was well-respected as composer and composition teacher at the Liszt Academy in Budapest, where he reigned from 1907 until his death, teaching most all of the composers of note that followed in Hungary. Before that he was the pupil of Janos Koessler, who also taught Bartok, Kodaly and Dohnanyi. Weiner is perhaps best known for the scherzo "Prince Csongor and the Goblins" and the Suite from the same ballet, Csonger and Tunde. For the current recording we have a reading of the complete ballet from the revised 1959 score, a first recording, and his Ballad for Viola and Orchestra (Naxos 8.573491), also a first recording in this form (see below). Both are well-played by Valeria Csanyi and the Budapest Symphony MAV, with Mate Szues nicely taking on the viola solo role for the "Ballad" and the Jubilate Girls Choir sounding angelic on the ballet. Weiner makes use of folk material in much of his music, and you can hear thematic elements that have that ring to them in these two pieces. That he neither sounds like Bartok or Kodaly is a credit to his way with the themes. The liner notes speak of his synthesis of Schumann and Mendelssohn with modern European influences and a Hungarian nationalist tendency. I would not say I didn't hear that in these works, but there is also a sort of neo-impressionist glimmer (which, yes, you can hear prophetically in Mendelssohn's "Midsummer Night's Dream"). The "Ballad" was originally intended for clarinet and orchestra; actually a first version was for clarinet and piano, with a viola part included as an alternate, this in 1908. Weiner orchestrated the music twice and it is the second from 1948 that we hear with the viola part for a first recording. 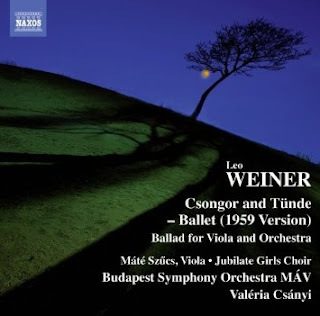 The music is rhapsodic without a touch of mawkishness, a rather pronounced impressionistic flavor to it and a memorability that marks Weiner an excellent melodist--but then that is also true of "Csonger." The ballet, originally written in 1913, has 14 movements, the outer ones featuring the girl's choir.It is music of great charm, well orchestrated, thematically alive. In Weiner we have someone who avoided later modern trends as a whole, staying with the classical music-Hungarian music nexus as he embraced it early in life. So both works have their origins in his first flush of recognition in the early years of the century and aside from undoubted refinements in the recrafting of later versions, keep that initial synthesis intact and alive for us to appreciate. This recording piques my interest. I'd like to hear more of Weiner's music. Anyone with an interest in 20th century Hungarian composers would find this rewarding and illuminating, and, for that matter, so would the general classical enthusiast. The performances give us the music in the full flush of its springtime bloom. Nicely done! If you are a young fantastic pianist doing Chopin's finest potboilers, be remarkable or you might as well go home. Alexei Tartakovsky is just that on Plays Chopin (self-released) in a live concert recording from Warsaw Philharmonic Concert Hall, 2015. Fantastic and remarkable...I do not use those words often, especially as it applies to Chopin. So that translates into a huge amount of respect and awe for this Semi-Finalist of the 2015 Chopin International Competition and winner of several others. We hear him in sterling form playing the "Ballade, op. 23," the "Polonaise-Fantasy, op. 61," the "Polonaise, op. 53," several "Nocturnes," and the "Sonata in B-Flat minor, op. 35." There is a tremendous passion and kinetic energy unleashed in these performances, something you might expect from a first-ranking virtuoso of our time, doing justice to the high demands of classic Chopin. But with all that you get a supremely musical reading, all the right notes, yes, but with a personal spin that puts Tartakovsky squarely into the music as someone who has drilled deeply to the core of each piece, each movement, and found himself within. Listen to his way with the funeral movement of the Sonata for what I mean. It sounds new, for as many times as one has heard it. It sings, it suspends time, it carries us into a special world. So needless to say I recommend you hear what a bright star in the new generational firmament can do with music you have heard so many times. I never tire of Johann Sebastian Bach, especially much of the solo repertoire. Of course that does not mean I automatically love every version that comes out. 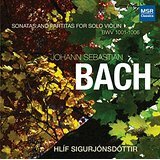 But the new 2-CD performances of Danish-Icelandic violinist Hlif Sigurjonsdottir doing his Sonatas and Partitas for Solo Violin (MSR Classics 1605) hits a nerve with me. Of course the beauty of the music bears more than one interpretation, and I find that Ms. Sigurjonsdottir's way with the music adds a fresh dimension. Part of that undoubtedly has to do with her mentors, Bjorn Olafsson (who in turn studied with Adolph Busch) and Gerald Beal (who studied with Heifetz). They immersed her in these Bach works from an early age (in Olafsson's case) and went over the works with her in detail (in both cases) so that by the time she was a fully formed violin virtuoso she had absorbed and furthered a performance tradition (or two) that comes through strikingly on these recordings. Hlif does not give us a rigorously baroque reading. She does not fill her phrases with a lot of ornamentation. Yet this is not an overly rubato-drenched romantic reading either. It IS a lovely and very lyrical reading that has more ecstatic expressiveness than I've heard elsewhere, a kind of steady-state expression of the joy of Bach's genius. Her tone is full without being vibrato heavy. There is a luminousness in her sound that suits the music quite well. This is first-rate interpretation, singularly sensitive to all the nuances of the music while bringing out the sheer beauty of the parts. If you already have a version or two of these pieces, this will augment the pleasure of the music with another reading, one that is vivaciously modern. If you do not have the music, here's your perfect chance to get an excellent version. Bravo! With all the releases flying about these days plus the cumulative effect of all one has heard it is relatively easy to miss some fine music by composers you might not have been exposed to for reasons having nothing to do with the music itself. 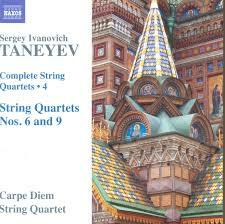 Sergey Ivanovich Taneyev (1856-1915) is one of those unknown to me; his Complete String Quartets 4 (Naxos 8.573470) by the Carpe Diem String Quartet not something I might have taken a chance on in my pre-review days. But as it so happens I have this season and I am all the better for it. Tchaikovsky was his mentor, Rachmaninov and Scriabin his students, yet as far as his own music goes he is not well-known. Tchaikovsky admired his way with counterpoint and his meticulous approach to craft, calling him the "Russian Bach." His chamber works are perhaps the more widely admired of his output today, and the string quartets are perhaps most lauded by those who take the time to know them. His "String Quartet No. 9" (1883) was one of three quartets that were published long after his death, in 1952. His "String Quartet No. 6" (1905) was his very last. Both are integral and comprise the Volume 4 we look at today. They are romantic works with folk elements and thematic development of a high luster, brilliant works less sentimental than strongly emotive. Hearing them one is readily put into the framework of the time period concerned, yet the music does not lend itself to easy comparisons or parallels to others working in the quartet realm at that point. In short they have an originality, an inspired and extraordinarily well crafted way about them. The ninth is especially fine, but both have much to appreciate in them. The Carpe Diem String Quartet gives the music a fully dimensional reading, showing a full command of Taneyev's vocabulary and a great respect, even a love of the works. They give us near ideal performances in this volume, and go a long ways in framing the music to bring out the finely wrought beauty of Taneyev at his best. Very highly recommended. There is so much wonderful music from the late Renaissance-early Baroque period by masters more known to scholar-specialists than lay listeners that we should not be surprised that much has yet to see the light of day in recorded form. Today's disk of vocal gems by Bonifazio Graziani (1604-1674) (Naxos 8.573256) is a happy example of such things, Consortium Carissimi under director Garrick Comeaux doing the Adae Oratorium, Filli Prodigi Oratorium & Five Motets, all in first recordings. The liturgical music situation in Rome around 1650 was lively and intense. Motets for vocalists and instruments were an important component of the Latin mass at the time and we hear five excellent examples here. The two Oratorios on the disk were slightly more ambitious works, longer and with a small choir in addition to the group of soloists. Both were likely performed during the Easter season as part of the Holy Year celebrations of 1650. 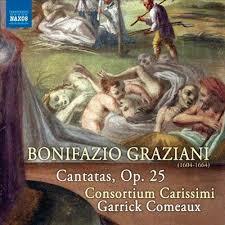 Graziani's music is excellently performed by Consortium Carissimi in period fashion, with very little vibrato. They are nicely seconded via the accompaniment of archlute, theorbo, viola da gamba, sackbut, harpsichord and/or organ depending on the work. The vocalists are top notch as are the instrumentalists. Graziani's music is beautifully crafted. It speaks to us eloquently. Early music enthusiasts should not hesitate on this volume. It has everything going for it. Those who do not know the vocal music of the era well will no doubt respond readily too. It is a very beautiful recording! Today we get the chance to consider two Piano Quintets (Naxos 8.571355) from two English composers who in the first decades of the 20th century were considered some of the bright lights on the English scene. Their music and reputations suffered some eclipse in the later years. Now we can hear their music with "fresh ears" and worry less about how "progressive" they may or may not have been compared to others on the contemporary landscape at the time, and evaluate the music on its own terms. 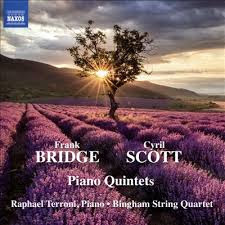 Frank Bridge (1879-1941) gives us a seriously well-crafted "Piano Quintet in D minor, H49a" (1904/1912), a rhapsodic, romantic work with a good deal of sentiment, a bravura piano part that bears comparison with a Rachmaninov or a Liszt and good thematic wealth that is developed skillfully. There are touches of his times to be heard, but no evidence that he was any sort of obvious innovator. He is not precisely Elgar-like here, and not exceptionally tied with any English school, but a thoroughly Europeanized late romantic who had mastered his craft. Cyril Scott (1879-1970), on the other hand, has in his "Piano Quintet No. 1" (1911?) a pronounced impressionistic component that goes along at times with a fair amount of romantic rhapsodic demeanor and at times a striking melodic touch (listen especially to the third, adagio movement). The harmonic palette is more colorful and modernistic, there is a more chromatic aspect to his music, and the expressive means at his disposal have at times broken free from structural convention and allowed to freely follow modal ideas without a lot of attention to modulation and development, more in a fantasia-like manner than not. I find the Scott work the more interesting of the two, though it is great to be able to hear both works and fill in the blanks in the Anglo early modern scene. The performances are very much first rate and perhaps more noticeable in the Scott work because of its greater novelty of means. Anyone interested in the English school of the 20th century will revel at the chance to hear good performances of these works. The music uplifts and gives you plenty to contemplate as well. Perhaps near essential for the Scott, very illuminating for the Bridge. Give it your ears. William Bolcolm (b.1938) is one of those composers who throughout his career has touched on a variety of style complexes and somehow has managed to make the music very much his own. He is one of the most compelling of living composers, in my opinion. We catch up with him with two memorable works from 2006 and 2009: Canciones de Lorca, Prometheus (Naxos 8.559788). 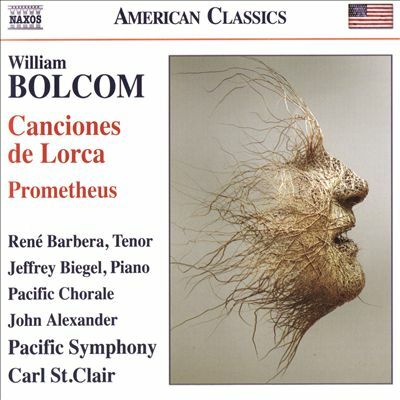 Tenor Rene Barbera and the Pacific Symphony under Carl St. Clair do a wonderful job on the Lorca work; John Alexander and the Pacific Chorale with Jeffrey Biegel on piano combine with the orchestra to give us a very nice reading of "Promethus." These are prime works of Bolcom in his later phase, where tonality and modernist touches work well together, consonance and the spice of dissonance accommodate one another in a fertilly creative zone that is all Bolcolm's. Canciones de Lorca sets several poems of Federico Garcia Lorca to music. The work takes on the various moods of the poetry and Bolcolm shows genuine brilliance combining Spanish traditional strains with contemporary Bolcomism. Barbera is dramatic and expressive in his role, originally fashioned for Placido Domingo. Those are big shoes to fill but Barbera holds his own. The orchestral parts breathe in ingenious ways. "Prometheus" is somewhat more thoroughly modern and expressionist. Prometheus in the modern-day incarnation is chained to a rock and gnawed away by our technological dependence, something we all experience today. It is music of moving gravitas, describing in aural terms the often autonomous demands made on us by our hundreds of years of "progress." The music is exceedingly well crafted and luminous in its dark brooding, though that may sound contradictory. Tonality and dissonance stand side-by-side and work together for a result that brings the whole convincingly together and creates a complex set of moods well suited to the subject matter. Both works serve to remind us that Bolcolm remains vital. The disk shimmers with the sounds of a fully matured master of his vocal and orchestral resources, a sound poet who has grown and made of his music a most distinct amalgam that combines what is "in the air" today with an inspired immediacy. Brilliant! Time passes on and we are celebrating the 80th birthday year of the extraordinary minimalist composer Steve Reich. 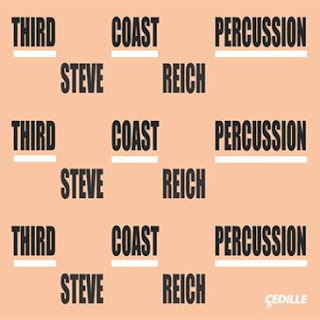 The very capable group Third Coast Percussion rings out to mark the occasion with an album of some of his gems for pitched percussion, simply entitled Steve Reich (Cedille 90000 161). Reich's enormously influential and enthralling work with interlocking, evolving rhythmic-melodic patterns has never been topped via his music for mallet percussion groups, though it has of course been equaled by other mixed and completely different instrumentations. 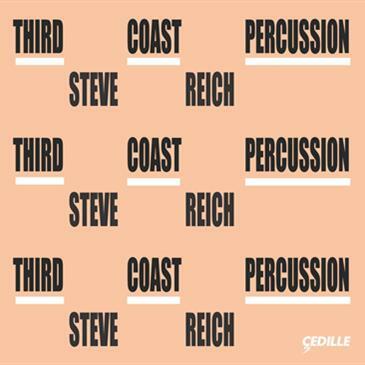 Third Coast Percussion concentrates on some of the mallet gems: the "Mallet Quartet" (2009), the "Sextet" (1985), which adds two pianos to the mallets, "Nagoya Marimbas" (1994) for duo, and "Music for Pieces of Wood" (1973) which for this performance they selected and pitched five thick slabs of purpleheart wood, played on their edges with large dowels. The latter is probably the definitive recording, the others rival and equal others. As a result this volume is excellent, essential and breathtaking, given the landmark quality of the pieces. Marimbas and vibes, the sounding of metal and wood, are signature Reichian means that have spurred him on to produce some of his most articulate structures in motion. And in surveying these works the various approaches to the dialectic between repetition and change, so important to the continuity of his work, are nicely on display, from the additive entrances and exits of the wood piece or the abrupt but coherent shifts in "Sextet." The consistently present flowing organicism allows Reich to create long forms from divergent contrapuntal elements influenced by Gamelan, African ensembles, jazz and other sources. Most importantly they become brilliantly restructured constructions of pattern and transformation that in part make Reich so innovative. And really, other than the sheer aural pleasure of his music, that is one place where we might pinpoint what makes Reich so special. In any other hands before there was Reich the world sources were borrowed nearly piecemeal or built up out of, to metaphorize, large blocks of sound fitted together like a rubix cube but essentially imported whole, in chunks. This may be a simplification, but Reich's version of minimalism was all about how to take all that apart and rebuild from the ground up, in each case finding brilliant ways to make the music process and the important element of change seem perfectly inevitable with his transformational techniques. He solved the problem of how to make change a contrary force to sameness, and to make that all work beautifully. His solutions allow us to hear mesmerizing repetitive patterns that remain of high interest over time by never staying in one place for too long. And in that way he influenced all who came after. One might argue the Riley's "In C" faced the same problem in other equally innovative ways, and so we might place the two-side-by-side as the primary movers of the music and what came after. And ultimately the brilliance of Reich is that one never feels like one is subjected to patterns that follow one another willy nilly, but instead seem like the unfolding of a single organic whole. Combine that with the brilliance of invention of the elements themselves and how they interact and you have music that one never wearies of, no matter how many times one has heard it. Third Coast Percussion gives us some beautifully exemplary performances fully worthy of the 80th birthday year. Remarkable works, played remarkably well. Everyone should hear this album, this music. Reich is one of our greatest treasures! 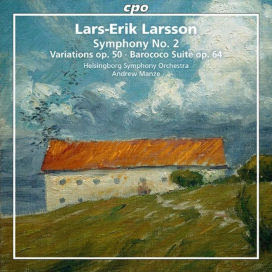 Swedish modernist Lars-Erik Larsson (1908-1986), I'll admit, is not a composer I have become very familiar with until now and the CD Orchestral Works Vol. 2 (CPO 777 672-2). It is in SACD Surround/Standard Stereo CD format so provides compatibility with both systems and sounds very good regardless. The Helsingborg Symphony Orchestra under Andrew Manze give us nicely contoured, enthusiastic readings of the works contained in this volume, which are the "Symphony No. 2, op. 17," the "Variations for Orchestra, op. 50," and the "Barococo, Suite for Orchestra, op. 64." Larsson sounds nothing like fellow-Swede Allan Pettersson, nor would there be any reason to expect that he would. And he is less radically modern than Blomdahl. His Symphony (1928) has a gigantic thematic sweep a la Bruckner, perhaps, yet sounds more contemporary and original, freely tonal with a step beyond Sibelius and Nelsen I suppose one could say. It is an engaging work. The "Variations" (1962) show a more modern Larsson, effected by Hindemith and Schoenberg's 12-tone method, somewhat neo-classical in form and restlessly edgy in an advanced tonality. The orchestration is exceptionally interesting and more Nordic than Germanic, I suppose one could say. The "Barococo Suite" brings us up to 1973 with a renewed neo-classical stance and a sort of synthesis of the earlier ventures in tonality tempered by a heightened sectional treatment of orchestral forces. It has a rather delightful zest to it that stands on its own with a great deal of charm, a post-Stravinskian modern tinge and thematic abundance that wears well with repeated listens. So really we have three very different periods/styles in this volume, which all together give us a pleasing and vivid picture of the composer through time. It is music one grows into readily and ultimately brings us some worthwhile Larsson, well performed. I found it bracing, contentful and rather masterful on the whole. Those like me who are not intimate with his music will find much good to discover. Swedish modern specialists will be no doubt equally happy with this one. A fine disk it is. 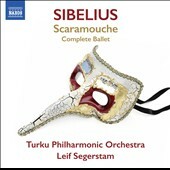 From the Turku Philharmonic and Leif Segerstam's ongoing recorded series of lesser-known Sibelius orchestral music comes the latest, Scaramouche, Complete Ballet (Naxos 8.573511). It was completed in 1913, despite Sibelius' misgivings on the pantomime and its addition of dialog. He nevertheless devoted considerable attention and care to the score. It had to wait until 1922 for a first performance, which was rightly hailed for the music, less so for the ballet scenario. And so lucky for us we get to hear the whole of it by Segerstam and company, two acts and some 71 minutes of ravishing music, with solo parts for Bendik Goldstein on viola and Roi Ruottinen on cello. It is, so the liners tell us, Sibelius' only continuous dramatic score, other than his opera. The music goes from idyllic to more dramatic as it follows the story of the spellbinding musical charms of the dwarf and his ultimately evil intent. It is vintage Sibelius, glowing with his lyrical abundance, his modern Finnish impressionistic-post-romantic brilliance in parallel to his Oceanides (1914) and Fifth Symphony (1915), perhaps not quite the masterpiece of the other two, but filled with that special Sibelius orchestral dazzle and thematically alive. Leif Segerstam and the Turku Philharmonic turn in the sort of spacious, idiomatically vibrant performance we have come to expect from this series. All who love Sibelius will find Scaramouche a beautiful addition to their library. Those who don't know him well might better start with the "Violin Concerto" or the Symphonies 4-7, but this one is a beautiful musical journey I'd imagine even for the uninitiated. Johann Simon Mayr, Saffo, Franz Hauk, Concerto de Bassus, etc. One thing about living through the modern world is experiencing the revival or eclipse of various composers. You may find a composer that has been de rigueur for many years is suddenly on the outs. And by the same token somebody completely neglected for 100 years or more might be coming into currency. The case of Johann Simon Mayr (1763-1845) shows sign of the latter, judging by the Naxos releases, anyway. He wrote 70 operas between 1794 and 1824 (!) and some 600 sacred works. He was well-respected by his peers. Yet today he is all-but-forgotten. 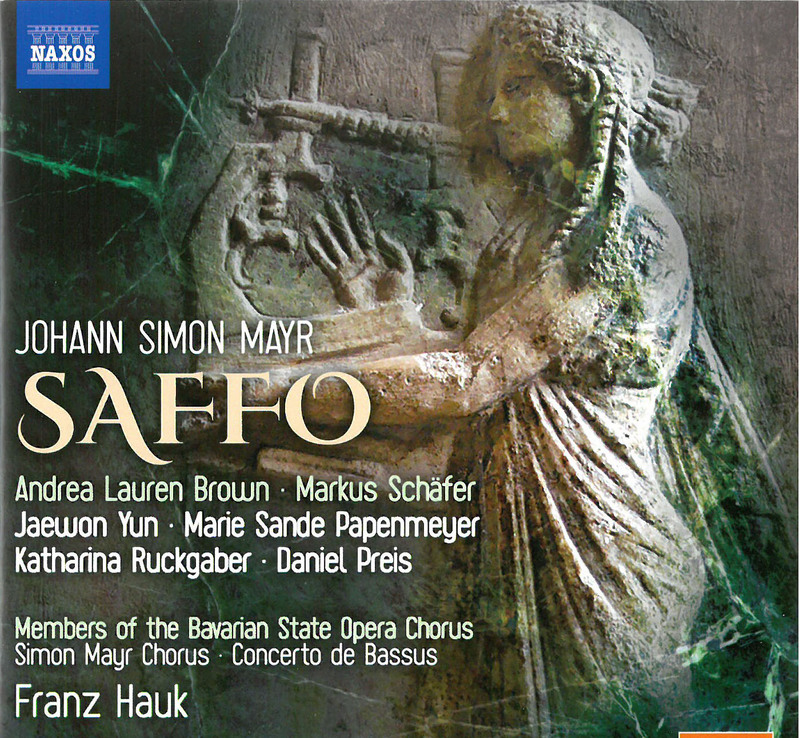 Franz Hauk with members of the Bavarian State Opera Chorus, the Simon Mayr Chorus, Concerto de Bassus and soloists give us a nicely burnished performance of Mayr's first opera, Saffo (1794) (Naxos 8.660367-68 2-CDs). Mayr lived and worked in Venice, was born in Bavaria, and subsequently was a champion of Haydn, Mozart and Beethoven. His operas (or at least this one, as my ears affirm) show their influence but in combination with the Italian style (Donizetti was one of his star pupils). Saffo has a rather irresistible charm about it in the hands of Franz Hauk and company. The soloists, choruses and orchestra give us a very attractive performance. You can hear the Haydn-Mozart-Beethoven influence in the finely crafted orchestral parts; there is a real tunefulness and exuberance in the arias, ensembles and chorus parts, certainly in a lively Italian manner that reminds of Donizetti, Bel Canto, and Rossini in the most positive ways. The plot is gone over in the liners and I will leave you to that if you find this interesting. From a musical perspective there is nothing lacking. Vienna and Venice commingle in ways that delight. Why is this opera not performed much these days, or for that matter the 69 others, which I have not heard? The opera scene as we know tends to fixate on certain works and not others, though Saffo at least musically has the sort of memorability that would recommend it. Fate and calcification are no doubt the explanations most relevant. We do have this marvelous recording, however. It is everything one would hope for in the verve and musical accomplishments of the company with Hauk at the helm. I find it quite moving! Opera buffs and their friends should undoubtedly feel the same way if they give the music a chance. Very recommended! 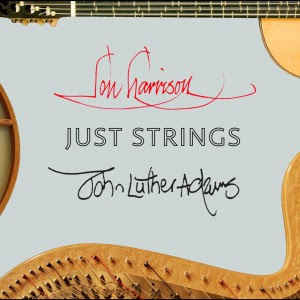 The combination of the ensemble Just Strings and the music of American iconoclasts Lou Harrison and John Luther Adams (Microfest MF7) seems both natural and just about inevitable. The combination of Alison Bjorkedal on harps, John Schneider on guitars and T.J. Troy on percussion is substantial and virtually perfectly conceived. The music often enough calls for the use of "just intonation," non-tempered tunings. The ensemble embraces this, as their name "Just Strings" implies. And they work their way through the pieces with a profound sympathy for the music. The Harrison and Adams works have a sort of new world, folk-like quality. Indeed the mature Harrison was a real pioneer in this realm and Adams gives us music here from a period (1995) where he was working in parallel modes. In all we are treated to six works, five in first recordings. For two of the Harrison pieces ("Harp Suite #2" and "In Honor of the Divine Mr. Handel") they are joined by the HMC American Gamelan for an increased and nicely "exotic" sonic stage. Harrison's works cross a broad span of time, from 1951 to 1992. They are wonderful examples of his diatonic, archaic world miniatures and his way with the harp. Both Harp Suites provide a wealth of Harrison, early to late. His short "Lyric Phrases" (1972) and the work honoring Handel (1991) give us further insight into his special sonances. Both Adams works, "Five Athabascan Dances" and "Five Yu'pik Dances," fit with the Harrison works perfectly and show an equally earthy directness. Just Strings give us definitive readings of the music, with considerable spirit. The HMC American Gamelan thrive on this music, too. It is a volume that wins the day by a lyrical panache and an authentic straightforwardness that characterize Harrison at his best, but then show us an Adams who communicates equally well in this realm. It is a beauty of an album on all fronts. Lovers of world-archaic new music modernism will find this highly worthy. Virtually anyone should find fascination here. Get the album! 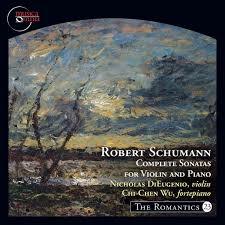 The three violin-piano sonatas of Robert Schumann were not often heard in my early lifetime. Hence I never got to know them. The first sonata has been performed more frequently than the rest, though still less than Schumann's other chamber works as a whole. The second has been given even less attention and the third was not published until 1956--and even then did not get much coverage. All that seems to be changing. The single CD Complete Sonatas for Violin and Piano (Musica Omnia 0610) as played by Nicholas DiEugenio (violin) and Chi-Chen Wu (fortepiano) is a product of the renewed interest but also a singularly effective set of performances that help us make ultimate sense of the music. As the liner notes explain, part of the problem has been Schumann's tendency in these works to restrict the range of the violin mostly to the two middle strings of the instrument, with little of the high-note brilliance one expected from the period. This in itself may have discouraged virtuoso violinists from performing them. That and the piano part's tendency to double the violin line or encase it in the piano passagework has caused some problems when played with the much louder modern piano. The balance in those cases was often enough skewed toward the latter, changing the character of the works as Schumann originally envisioned them. Chi-Chen Wu for this recording plays a beautifully sonorous 6 1/2 octave pianoforte constructed anew by R. J. Regier according to the specs of a Viennese instrument of Schumann's time. The piano in those days produced a special tone that was not nearly as forte as the modern instrument. As a result the balance between violin and piano is much more naturally in synch here. The transparency of tone of the earlier piano tends less to overpower the violin part but instead allows the violin equal partnership in the dialog with both parts clearly distinguished and readily grasped. All were written with a few years of each other. The first in 1851, the second in 1851, and the third in 1853, the last initially as a group composition by Dietrich, Brahms and Schumann in honor of the famous violinist Joachim. Later Schumann replaced the several movements by the other composers with ones of his own. The three presented by DiEugenio and Wu on this recording, with the period pianoforte, are totally convincing. Indeed the less percussive and sweetly fragile tones of the earlier instrument does much to engage the listener in the violin-piano interplay as Schumann conceived of it. And the idea that this music, as was once asserted, was the beginning of a decline of the composer's powers marked by his 1854 suicide attempt and oncoming mental illness does not hold weight. The music is as typically Schumann-esque as any of his better known chamber works. The single-minded restriction of the violin's range gives the music a darker cast, surely, but when played in conjunction with a period piano rings out with a subtlety and acoustic logic that may be missing in a standard version today. DiEugenio and Wu give the music plenty of the passion called for, but also a gentleness and sensitivity to the introspective aspects of the scores that help us hear contrasts and formal balances that a more bombastic, bravura version might miss. In the end we get interpretations that glow, that resurrect Schumann's intent, that thrive in the rich thematic material and show us that the three sonatas as a whole are fully deserving our attention and reward us with some very fine music. Schumann fans will revel in this release. But even those with an encompassing need for something not overly performed will find these works a logical progression between Beethoven and Schubert and the later ways of Brahms. It is music that delights. Very recommended.